In just one year, ARS geneticist Les Szabo and colleagues Charles Barnes, a plant pathologist, and lab technician Kim Nguyen have developed a PCR (polymerase chain reaction) test to rapidly identify agronomically damaging wheat rusts. 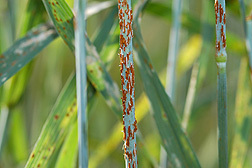 Rusts are fungal plant disease-causing agents. 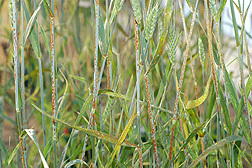 The ones that attack wheat are known as stem rust, stripe rust, and two species of leaf rust. Rusts affect just about every plant or crop in the world, with the notable exception of rice. So far, about 7,000 species of rust have been identified. The scientists, located at the ARS Cereal Disease Laboratory on the campus of the University of Minnesota-St. Paul, plan to develop tests for all the important rusts affecting the major small cereal grain crops: wheat, barley, rye, and oats. Extra funding from the U.S. Department of Defense—along with many previous years of research on rust taxonomy—enabled Szabo to develop the first detection test so quickly. "We had an extensive database of DNA sequences for most of these species from our previous research," he says. "But we had to generate many more to develop this test, which identifies species by detecting specific DNA sequences within a gene." The test will likely be used by diagnostic laboratories to analyze samples from around the country and the world. Without this test, accurate identification of rusts can be difficult. "We often tend to assume the identity of a rust based on visible symptoms and on what's previously been found," says Szabo. "For example, if it has light-yellow-colored spores, it's assumed to be stripe rust. But as we have found, this is often not the case." He believes that with new molecular tools, scientists will find that there are many more rust species than the currently described 7,000. Identifying the species is the first phase of Szabo's rust research. The next phase is identifying subspecies and genetic lineages. "This would allow us to track the movement of these rusts worldwide and to immediately recognize types of rust new to this country," Szabo says. "That knowledge would help us in many ways, especially in predicting the subspecies or race of a newly isolated fungus. If we know its race, we will then know what crop varieties it will attack. This information will be important to farmers. In addition, we can inform plant breeders of which races are in this country, which ones may be on the way, and which crop varieties are in danger, so they can get an early start on breeding resistant varieties of wheat, barley, and oats. "—By Don Comis, Agricultural Research Service Information Staff. Les J. Szabo, Charles Barnes, and Kim P. Nguyen are with the USDA-ARS Cereal Disease Laboratory, 1551 Lindig Ave., St. Paul, MN 55108; phone (612) 625-3780, fax (651) 649-5054. "Identifying Rust Enemies—Precisely" was published in the June 2004 issue of Agricultural Research magazine.